Dhatri (Amalaki), Yashtimadhu, Lauha Bhasma, Guduchi. 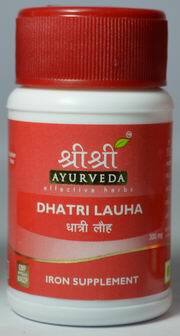 It is used in the treatment of gastric ulcers, anaemia, jaundice, dyspepsia, eye disorders, greyingof hair, constipation, distension of abdomen due to obstruction to passage of urine and stools, impaired digestive fire, bleeding disorders. 1–2 Tablets twice daily with ghee or honey. Explore more Sri Sri Ayurveda Trust products.